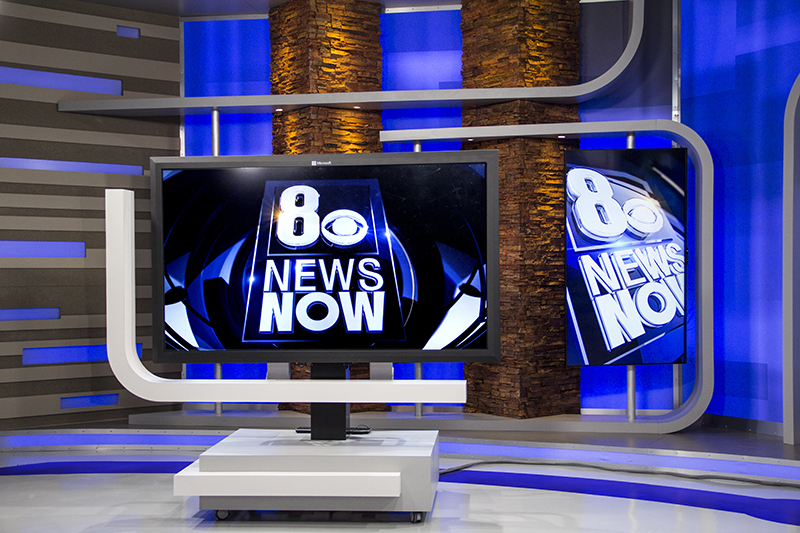 Las Vegas’ KLAS-TV debuted a new look at noon today with a bold new set and new graphics that match the vibrancy and vibe of Sin City. 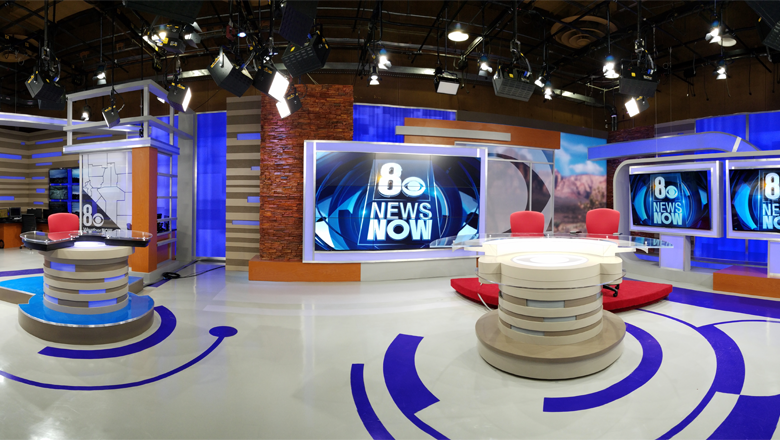 The new set for 8 News Now, from Park Place Studio, is a sprawling, 360-degree multi-venue design that’s also stocked with technology. 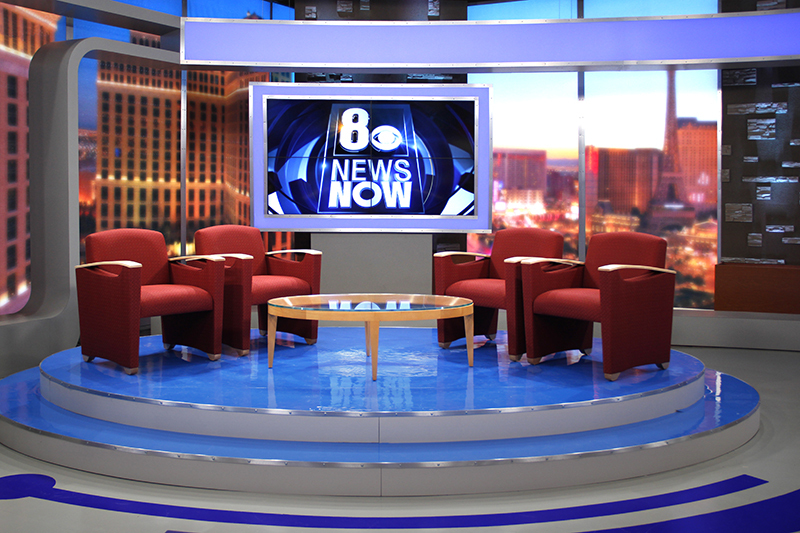 Nexstar, which acquired KLAS-TV in February 2015, began exploring a new set shortly after the sale. After just under a year of planning, Park Place was hired in January to design the new set. The total investment of the set and other updates to the station’s news infrastructure came in at about $1.3 million. Included in that figure was an upgraded and expanded lighting grid, replacing all-LED lighting instruments as well as updates to the station’s iNews, WSI and ChyronHego systems and investment in the Storyteller touchscreen platform from AccuWeather. “One of the things we wanted to do on the new set was to embrace Las Vegas without descending into ‘Vegas’ clichés. If you visit Las Vegas regularly, or live here like we do, you’ll see that Las Vegas is in a constant state of reinvention,” said Henry Vazquez, creative services director for KLAS-TV. To that end, the new look includes subtle nods to the bright bold colors and neon lighting of the strip through the used of horizontal, backlit bands as well as curved elements that snake around the set walls. Vazquez encouraged the design team at Park Place to research certain casinos that they felt really “got” Southwest design. With this update, the station shifted from using large anchor desks in favor of smaller pieces that play a big role in allowing the station to move away from the “box-in-a-box” shot framing model. “We made a conscious decision to leave (traditional TV framing) behind. So we configured the set to take greater advantage of dynamic angles,” said Vazquez. The new set is stocked with two large-scale video walls, along with eight additional large format monitors, including a two separate three-panel arrays to one side of the anchor desk. In addition, the station’s Storyteller-equipped Microsoft touchscreen is mounted on a rolling cart for more flexibility. Also added is a separate, mini-anchor desk just for weather, which also includes a unique “tower” structure that’s fronted with a frosted rendition of Nevada neatly tucked into the upper right corner. Additional monitors are found in the work area behind the weather desk. Next to this is the weather area’s weather wall — but one thing you won’t find is a green screen. 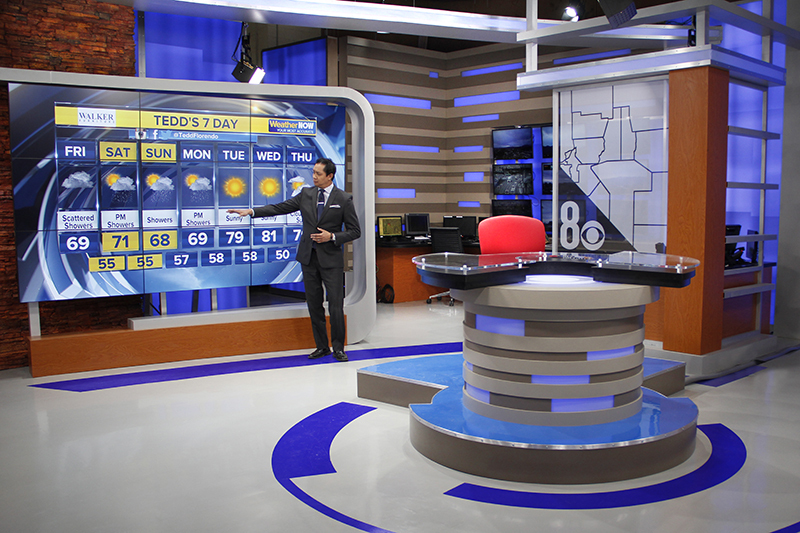 “With a full, 360-degree broadcast environment as our goal, we felt a chroma key wall would limit us,” explain Vasquez, adding that the station’s forecasters are also now free to wear any color they want. Next to the weather center is a multipurpose and interview area featuring cityscape views and a large monitor. 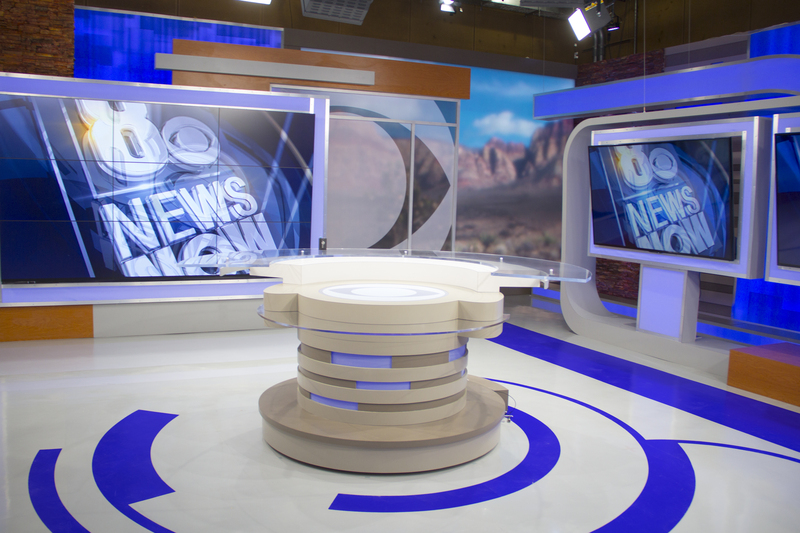 Throughout the set, the CBS eye is included, as well as ring-like markings on the floor emanating from the two anchor desks — which are also a subtle nod to the station’s network’s logo. The entire set is also equipped with color changing LED technology. “As we’re seeing across the country, visual coding for breaking news or extreme weather is proving a great way to communicate to the audience,” said Vasquez, who also pointed out that new graphics workflows that let newsroom staff create graphics on the fly also frees up the art department to create more in-depth “explainer” graphics for enhanced storytelling. 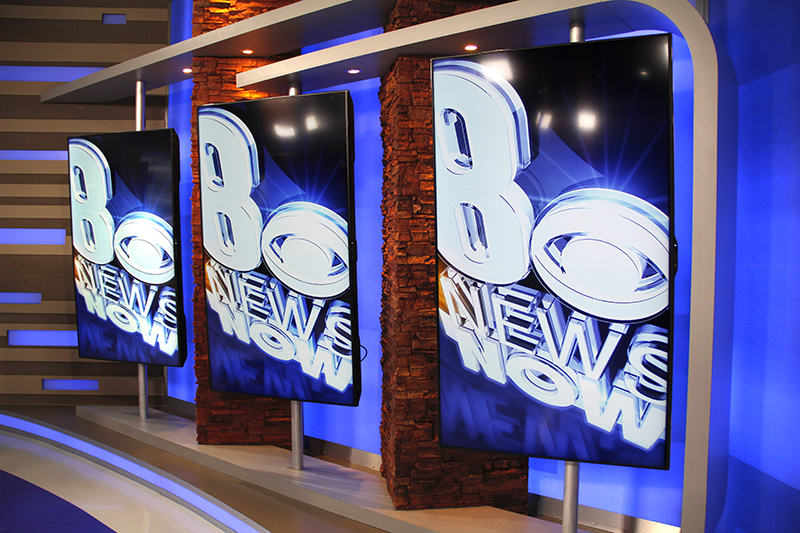 Along with the new set, KLAS-TV also debuted a new graphics package that uses a mix of deep blues and bright, teal shades arranged in rings to tie into both the set’s floor graphics and the CBS logo.